The Dinah story is told in the Book of Jubilees (xxxiv. 2-8) in a different way (comp. Charles ad loc. and the literature cited by him). In the Midrash it is said that all the tribes had intermarried in Egypt, except Reuben, Simeon, and Levi, which neither intermarried nor worshiped idols (Num. R. xiii. 8 and parallel passages). With reference to Gen. xlix. 7, the Midrash states that in the affair with Zimri (Num. xxv. 1-9) there fell of the tribe of Simeon 24,000 men, whose widows were scattered among the other tribes. All the beggars and elementary-school teachers were of the tribe of Simeon (Gen. R. xcviii. 5, xcix. 7; Num. R. xxi. 8). The majority of the mixed multitude that had come out of Egypt with Israel intermarried with the tribe of Simeon (comp. Chefetz, "Sefer Midrash Abot," s.v. "Simeon"). 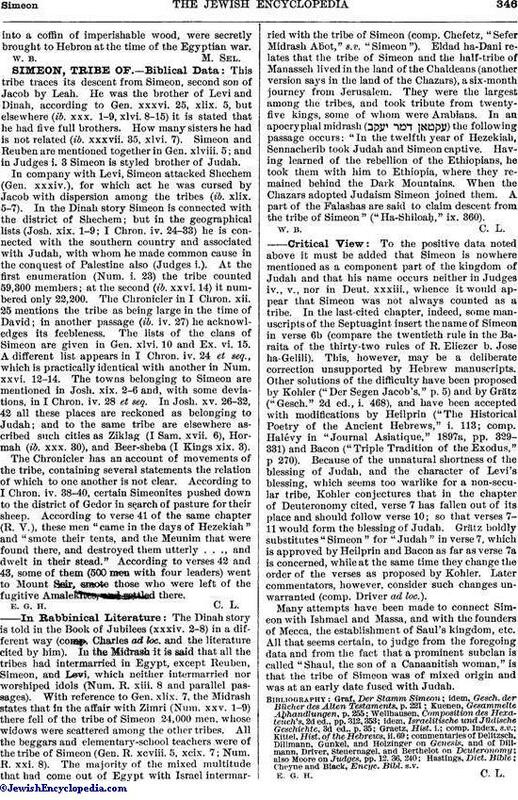 Eldad ha-Dani relates that the tribe of Simeon and the half-tribe of Manasseh lived in the land of the Chaldeans (another version says in the land of the Chazars), a six-month journey from Jerusalem. They were the largest among the tribes, and took tribute from twenty-five kings, some of whom were Arabians. In an apocryphal midrash ( ) the following passage occurs: "In the twelfth year of Hezekiah, Sennacherib took Judah and Simeon captive. Having learned of the rebellion of the Ethiopians, he took them with him to Ethiopia, where they remained behind the Dark Mountains. When the Chazars adopted Judaism Simeon joined them. A. part of the Falashas are said to claim descent from the tribe of Simeon ("Ha-Shiloaḥ," ix. 360).